Katrina Parker, who hovers between good and excellent, had one of her top performances Monday. For the first time in five weeks since the season began, judges were unanimously satisfied with each "Voice" competitor who performed in Monday night's semi-final round. Tony Lucca, clawing his way back after ex-Mickey Mouse Club-pal Christina Aguilera shrugged him off as "one-dimensional," kicked and twisted around the stage, singing — perhaps to Aguilera — "How You Like Me Now?" by the Heavy. Though the undertones of dissatisfaction were apparent in Aguilera's restrained critique ("It was definitely more slickly done. I thought it was fun. Did Adam teach you those dance moves?") the absence of blatant criticism from his harshest judge was remarkable and set the tone for the rest of the competition. Katrina Parker, whose voice has teetered between near-perfection and rough-around-the-edges, leaned toward perfection Monday with her performance of "Killing me Softly." 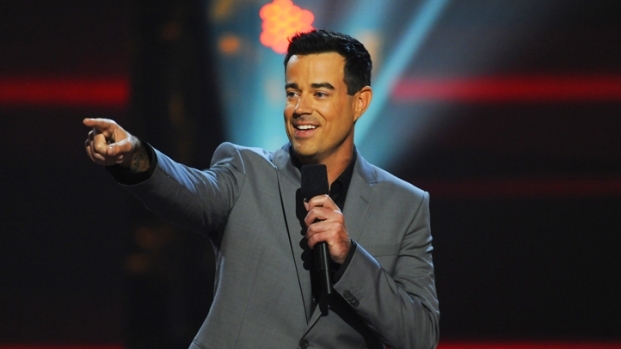 Host Carson Daly of the "The Voice", takes us on a backstage tour as the show begins its second season on NBC. Team Blake's Erin Willit put her powerful pipes on "Without You," sometimes straying off key—but not enough to prompt any of the judges to address it. Jermaine Paul, who somehow, someway was stuck in backup-singing obscurity for his entire career, sang "Open Arms" so perfectly it could easily have been mistaken for a recorded and expertly produced track. The same went for Cee Lo's Jamar Rogers who sang a chill-inducing "If You Don't Know Me by Now." Team Christina's Chriss Mann went back to his roots and sang "Ave Maria," unapolegetically, to rave reviews, while the whispery Lindsey Pavao held the mic closer to her lips and impressed everyone with her voice, which had previously been so hard to hear. Rocker Juliet Simms, who closed the show, had the judges completely dumbfounded following her Janis Joplin-esque "It's a Man's Man's World." They stuttered and praised her, and said things like, "wow," as if she were the super star and they were her fans—which, for the moment, seemed to be the case. Eliminations resume on Tuesday, 9 p.m. ET on NBC.